A brief introduction to the Italian criminal justice system for readers more familiar with the Common Law system. In Common Law jurisdictions an accused is given a trial and that is the only occasion where a judgement is made as to the the facts in question and the guilt of the accused. If convicted the individual may appeal the conviction but the appeal is limited to mistake of law. Except in very specific situations a convicted individual cannot appeal on the basis of new evidentiary arguments, on questions of fact, nor on questions of guilt. The Italian criminal justice system is different in this respect. In the Italian system there is the initial trial but regardless of the finding of that trial an appeal is automatically granted, if requested by either the defense or the prosecution. Unlike the Common Law system this appeal is based on examining the facts and evidence again. 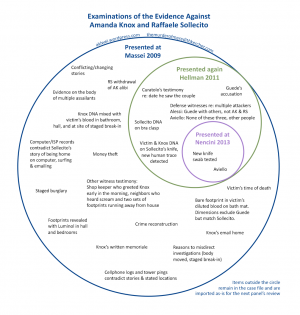 With the courts permission new evidence can be introduced and evidence already heard can be re-examined. Any evidence that was part of the original trial is included as evidence in the appeal but it is not heard again by the new court. The responsibility lies with the court to study the testimony and motivation report of the previous court. The Venn diagram to the left is a graphical representation of this. In the Italian system a final verdict can only be rendered by the Supreme Court of Cassation. After a criminal trial has been through an initial trial and an appeal the entirety of the material is presented to Cassation to render a verdict. If there are mistakes of law (and under the Italian system illogical reasoning is considered a mistake of law) Cassation can void the appeal and order that the appeal be done again. That is what happened in the trial of Amanda Knox and Raffaele Sollectio. The flowchart to the right illustrates the path traveled by all three accused. The path can only end with either an acquittal or conviction finalized by Cassation. All other verdicts are only provisional verdicts awaiting the decision of the next court. The Massei Trial started on January 16, 2009 and ended on December 5, 2009 with the conviction of Amanda Knox and Raffaele Sollecito for the murder of Meredith Kercher and several related lesser offenses. The court met 39 times to hear witness testimony and 9 days to hear closing arguments. These are the currently available transcripts of that trial. 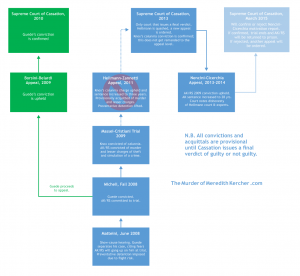 The collection below represents a complete collection of the entire trial with the exception of June 5th and 6th (Kercher Family), and June 27th (Amanda Knox's character witnesses). In addition we are missing three of the nine days of closing arguments. Summaries are in English and we are working towards translating all the transcripts into English. For transcripts not yet translated users of Chrome browser will allow you to machine translate the Italian transcripts into English or any language of your choice. The Hellmann appeal began on November 2, 2010 and concluded on October 2, 2011 with the provisional acquittal of Amanda Knox and Raffaele Sollecito. At that time, the court also lifted the preventative detention order that had kept Knox and Sollecito incarcerated from the day of their arrest. On March 26, 2013 the Supreme Court of Cassation quashed the Hellmann appeal ruling on grounds of illogicality and violations of Italian law. A new appeal was order and has since confirmed Knox and Sollecito's guilt. For people familiar with the common law system there are some differences that should be taken into consideration. In common law systems a convict must appeal on questions of law to be granted a new trial. In Italy defendants are automatically granted an appeal on questions of fact. In the common law system if a convict is successful in getting a new trial the new trial will have all the witnesses and all the evidence presented before the new trier of fact. In the Italian system, the evidence from the trial of first instance is part of the record. The trier of fact is required to study the evidence from the trial of first instance. The defense and the prosecution can request that new evidence be admitted and they can also request that evidence from the trial of first instance be examined more closely. For a graphical depiction of this, please see the Venn diagram at the top of this page. Florence Appeal - Testimony of Andrea Berti and Filippo Barni Testimony by the Carabinieri officers who tested "Trace I" on the Double DNA Knife. Amanda Knox's Email to the Nencini Appeal (English) read out in court on December 17, 2013. This page was last modified on 16 February 2017, at 17:53. This page has been accessed 215,527 times.